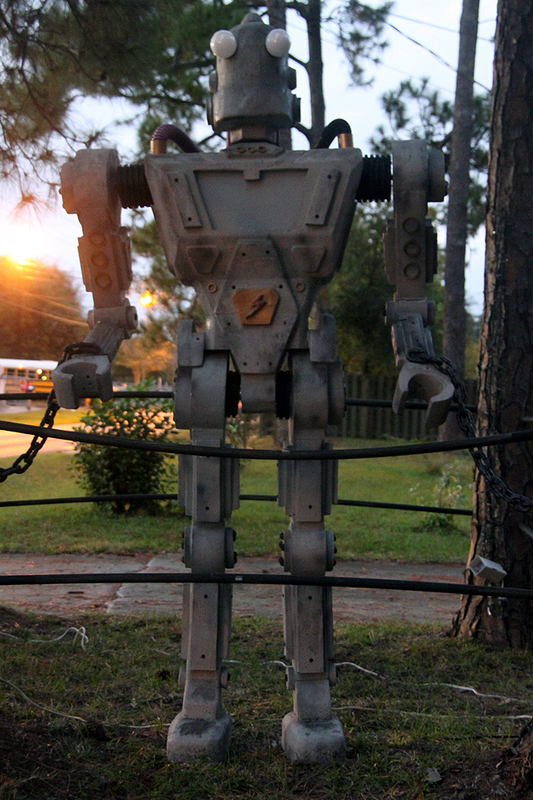 Giant Atomic Iron Giant Robot Halloween Decoration: My New Favorite Thing. Ever. 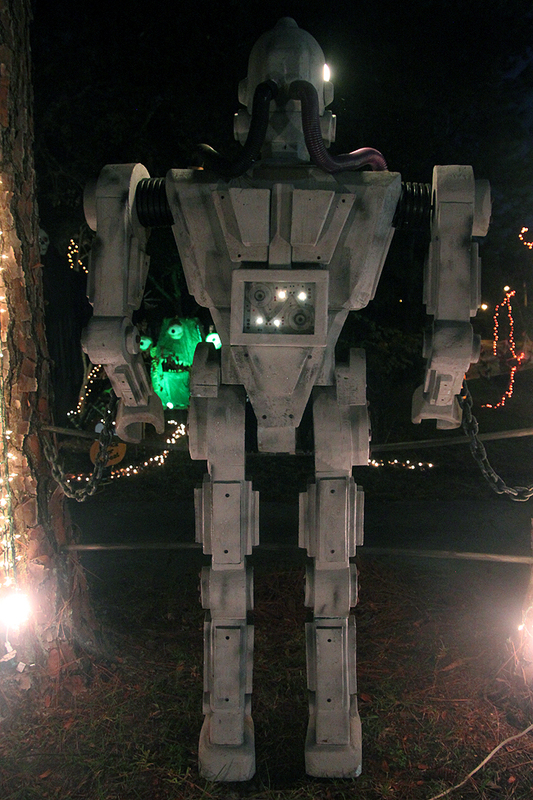 The homeowner, Larry, happened to be in and I chatted with him about the gorgeous robot and his amazing Halloween decorations. People in Jacksonville, Florida just don't do it like this anymore. Not from what I've seen. His house stands out. "I love Halloween," Larry explains. 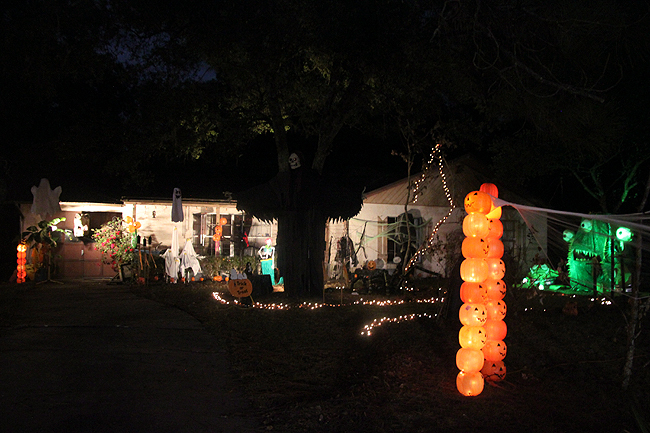 "We used to get very few trick or treaters, now we get hundreds." I love that ethos, that spirit of sharing. The Giant himself, though strikingly similar to the title robot from The Iron Giant (an amazing and underrated cult movie, watch it if you haven't) was created without knowledge of the movie at all! Larry made him with intent to create a very 1950s style robot, I love how two artists working independently arrived at the same design. 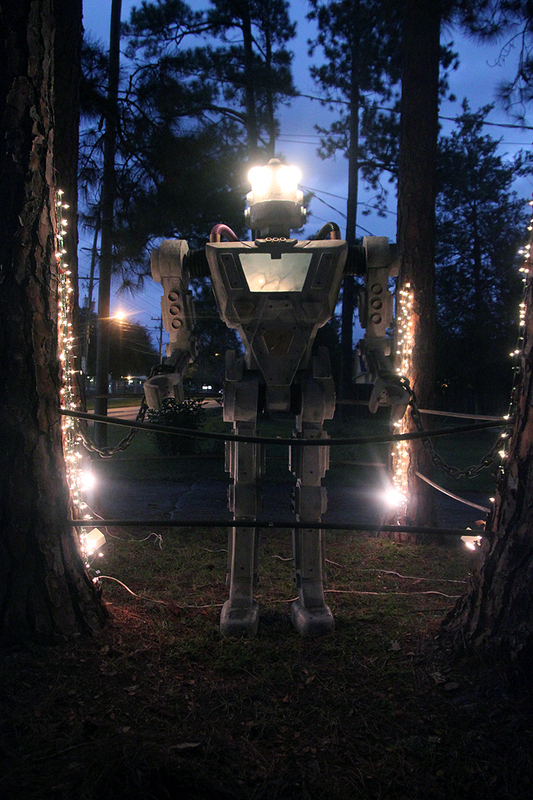 I was shocked to learn the robot was built entirely by Larry himself with styrofoam from a church ceiling! The level of craftsmanship is astonishing, the giant robot is perfect. Flawless craftsmanship. And Larry is not a "trained" artist. 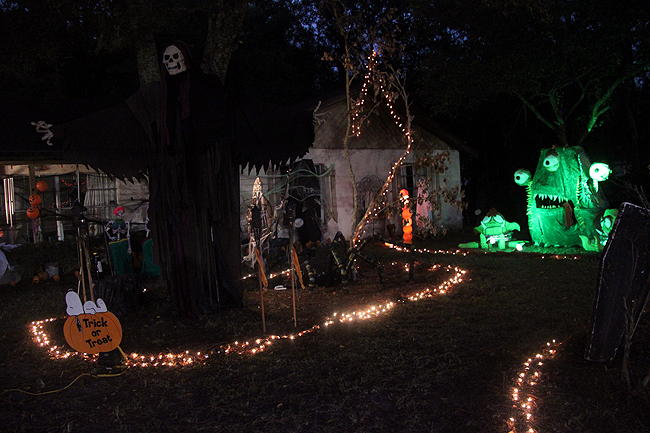 The yard was filled with other creative creations made from the hard church ceiling. This dinosaur looks like it was bought from the store, it's so perfectly crafted. 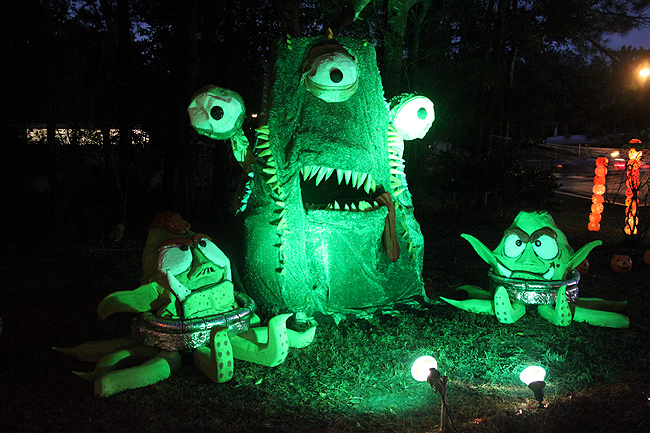 And these space aliens carefully cast in a green light are equally spellbinding. 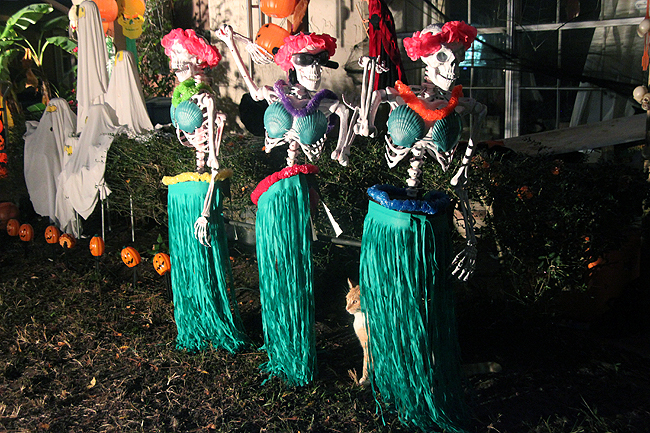 Some altered target skeletons decked in hulla gear add some whimsical kitschy charm to the yard. I love a good "overdone" yard with loads of kitsch to behold. There was a lot going on, it was beautiful. But of course, my absolute favorite is the robot. My lifelong robot obsession cannot be denied. The detail! 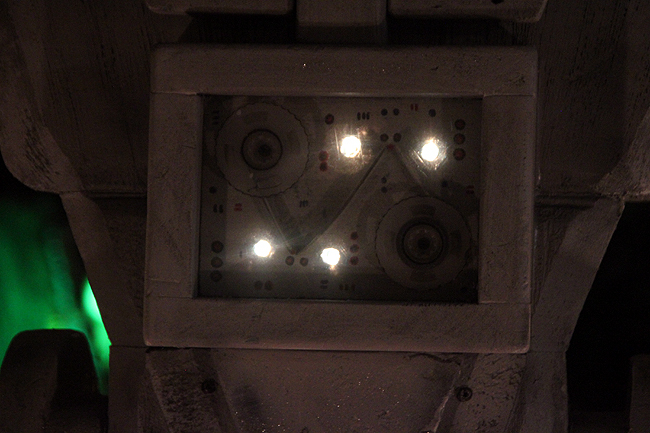 The lights! The way he lights up the darkness like a beacon in the night. Happy Halloween! What are you getting into? 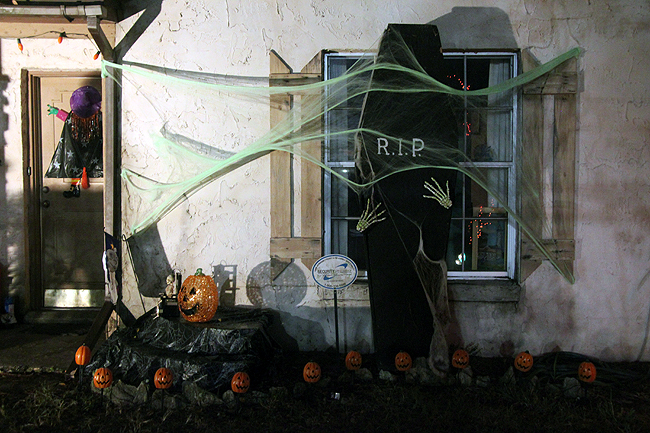 I think I'll kindnap my brother's kids for some trick-or-treating (some mansions by the river a short walk from my humble apartment always have lovely decorations and generous hand-outs.) Then perhaps a little partying with the BF. He's astounding. My favorite sighting of the year, perhaps. that is so awesome. Is it in Florida? Yes it's here in Jacksonville, Florida. It's directly across from Westside High School (formerly Nathan Bedford Forrest High School) where I attended for all 4 years. 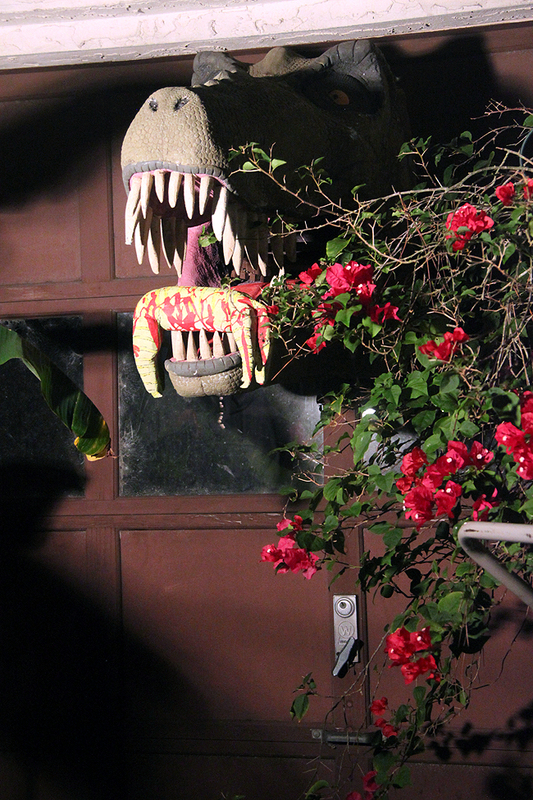 Brilliant yard décor and great post about it! We had 90-ish trick or treaters last night including a usual assortment of ghoulish characters, one cleaver-wielding nurse zombie, a headless horseman, a couple of Disney Elsa's (I thought there'd be more) and, perhaps my favourite, Robert Downey Jr. in his Ironman costume! 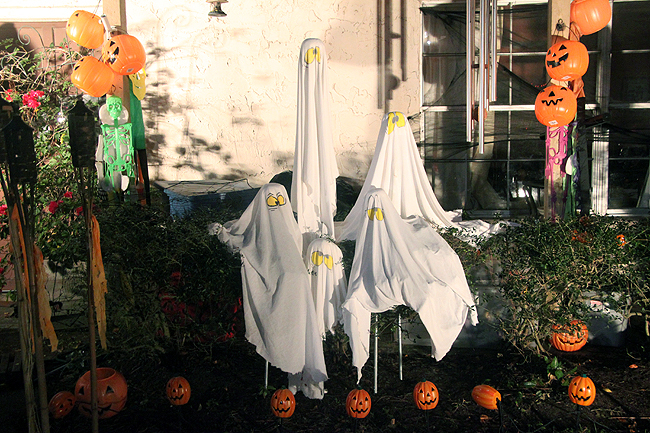 Aw man I can't wait 'til I have a porch so I can hand out candy, love the costumes :D Glad you liked the post. 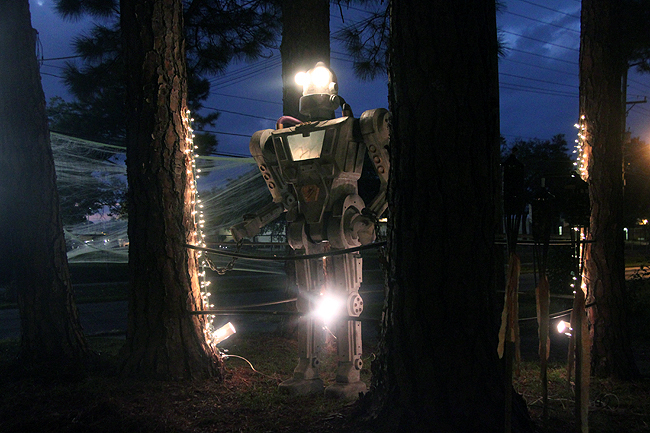 Larry is awesome and I want to hire him to make all the furniture in my house to light up..and shaped like robots. No joke.